Social media is the new easy and free way to communicate with your customers or potential customers online. Old advertising methods aren’t as popular as they used to be as there is so many digital channels to interact and engage with customers on. But you may not be aware of how to engage with your customers, so we have some easy steps to follow that will improve user engagement online. Engaging your audience on social platforms is one of the best ways to build your online community and brand awareness. If you are writing posts on any form of social media, it’s best to keep them short and to the point. You only have a couple of seconds to engage with your customers before the scrolling continues, so make it count. For Facebook posts, you’ll want to keep the length between 40-80 characters, these are known to have engagement rates of 86% for posts around the 40 character mark through to 66% for up to 80 characters. Make sure you are crafting engaging content that your users will want to read, share and engage with. There are lots of different ways you can interact with your customers on social platforms, be creative and try and identify what will not only get their attention but also make them share or return in future. As well as creating content, you can curate content that you have found online, this can be videos, tips, offers or new ideas that you think the customer will find useful and engage with. When customers post comments or send messages through social media they are reaching out to your company. Whether this is looking for information or writing a review it’s important to make sure you respond to everyone; whether this is positive or negative. With 34.5% of users seeing social media as a vital tool for customer service it’s important to take the time to reach out and talk to customers, say thanks for a positive comments or try to help if your customer had a negative experience. What is important is for the user to feel like they are being acknowledged and that the company is interested in them and what they have to say. Placing call-to-actions on your social media accounts such as directions or call now buttons allow customers to easily contact or access your business information. 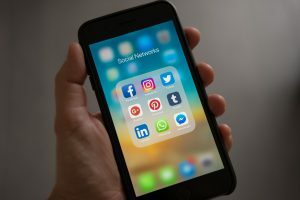 If your social media pages are easy to navigate around customers are more likely to return as they have received a high quality user experience. Select photos that will attract customers to click on your social media icon, pick an image they won’t forget and can associate your business with. Make your brand known and remembered! Track your customer engagement with social media management tools as you want to know what posts or comments are having the highest impact to your ratings. Various social media channels provide their own tracking including actions, clicks and impressions. It’s good to track engagement with your posts to determine what your customers are interested in most. Tracking can also help you find out what days and what times get the highest customer interactions. Hashtags are good to connect with customers on Twitter and Instagram mainly, this method can be used on Facebook but isn’t as popular. Use the appropriate hashtags that people are using or topics that they are searching. Hashtagify is just one online tool that provides a percentage of how popular a word or term is. Get reviews on your page or post/share them to let other customers know the reputation you have; a positive reputation can only lead to increased customers. Simple things like having all your business information up to date and letting them know how your business began and what you represent will attract customers. Customers like to know what your business is and how it is performing. You can also boost posts to reach a wider audience by targeting a specific location, age, gender etc. You decide who you want to target so that your post only goes out to those certain customers. With over 100 million videos watched everyday on social media, videos are a great way to engage your audience! We have seen a shift in the popularity of live video. Use Facebook live to engage with your audience. Stats show that live video had an engagement rate of 4.3%. An engaging photo or short video seems to be the thing that brings customers to your page to initiate a like, follow etc, so this is something all businesses should be doing. Tweets that contain an image generally receive 150% user interactions than posts without an image. Make sure you use images when posting as they tend to grab users attentions more than plain text when they are scrolling through the newsfeed. GIFs and emojis are a new way for customers to express themselves across digital platforms. As well as companies using them to connect with customers, as they understand and relate to these different creative graphics. Everyone loves a deal! Why not run an offer, competition or giveaway? You can get customers to fill in a form, share a post or visit a certain page on your site to be in with the chance of winning. This will also allow you to collect data on customers you can then re-target. Looking for more information on social media marketing? Why not have a look at what we do and see if we can help.